The Republic of the Philippines is not claiming entirely the South China Sea (SCS). The recently concocted geographical features of the West Philippine Sea (WPS) is stipulated in President Benigno Aquino's Administrative Order No 29, promulgated last September 5, 2012. The WPS does not explicitly configure and cover all of the contested SCS. In the said primer, WPS refers to the part of the SCS that is closest, and of vital interest, to the Philippines. Administrative Order No. 29, Section 1, provides that the “maritime areas on the western side of the Philippine archipelago are hereby named as the West Philippine Sea.” It includes “the Luzon Sea, as well as the waters around, within and adjacent to the Kalayaan Island Group (KIG), and Bajo de Masinloc also known as Scarborough Shoal” (2013:1 General Introduction). Meanwhile, Baviera and Batongbacal illustrate SCS as the much broader expanse of water, often described as a semi enclosed sea, bounded by China/Taiwan in the north, by the Philippines in the east, and by Vietnam, Malaysia, Singapore, Indonesia, and Brunei in the west and south. Scattered over the South China Sea are various geographic features, the most prominent of which are known internationally as the Spratlys, the Paracels, Macclesfield Bank and Pratas Island. There are overlapping claims by various countries to these features and to the waters and resources surrounding them, including parts of the West Philippine Sea (Ibid). Prof Rommel Banlaoi’s post on facebook last June 14, 2013 describes SCS referring to the body of water encompassing the Malacca Strait and Taiwan Strait covering an area of 3,500 square kilometers. China claims almost 80 percent of this water while Vietnam almost 60 percent. The WPS only refers to the part of the SCS within the Kalayaan Island Group (KIG) and the Bajo de Masinloc (Panatag, Scarborough) Shoal. The WPS does not cover the whole SCS. WPS is not a substitute name for the SCS. WPS represents a portion of the SCS that the Philippines claims as part of its maritime territory. Earlier in an interview with Asia Times Online last September 15, 2012, I said that China’s baselines are all expressed in its coastal geography through a U-shaped line in the South China Sea and in several offshore places. This exceeds those allowed by the United Nations Convention on the Law of the Sea (UNCLOS) and international law. On the other hand, the Philippines being an archipelagic country, is entitled to enclose large bodies of water within the baselines and assert sovereignty over it (read related article at http://www.atimes.com/atimes/Southeast_Asia/NI15Ae02.html). 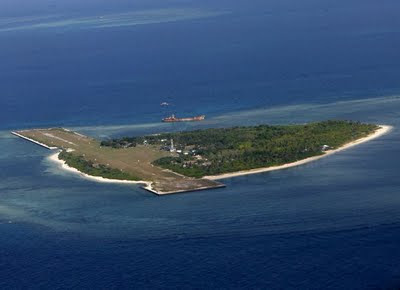 In a phone interview with Philippine Daily Inquirer, I clearly stated in the article published on December 2, 2012 that China’s most recent muscle flexing to lay claim to the disputed territories in the South China Sea is, therefore, a “wake-up” call for the Philippines. I said this in the context that our reawakening [from the escalating maritime disputes in SCS] always starts with a conflict. This made us look at our defense policies anew (read related story at http://globalnation.inquirer.net/58487/row-with-china-a-reawakening-for-ph-defense). Because of (my) profound and personal views in trying to expound details on our country’s Exclusive Economic Zone (EEZ) and freedom of navigation or to enlighten some closed-minded policy-makers on the state of our external defense; surprisingly, netizens in the borderless cyberspace continued circulating news feeds online. But oftentimes (mis)interpreted or (mis)translated my statements in various languages including Mandarin Chinese, Vietnamese, and even Spanish. I have had also monitored think thanks virtually collating news articles in their respective news bulletin each time I google my name. Some patriotic advocacy groups on facebook even invited me in their accounts to call the attention of defense leaders to help modernize our country’s armed forces. But being an academic, I need to be objective and non-partisan. I also had shared some of my thoughts on timely issues with China and Taiwan live via DZUP early this year. Flabbergasted when top opinion-maker, Inquirer’s Conrado de Quiros, favorably cited me last year in his column (see related column at http://opinion.inquirer.net/42123/crisis). The porous maritime borders of the Philippines certainly has affected us why we lost or losing some of our important territories from our adversary and neighboring claimant-countries in SCS. As Chinese naval power flexes its muscle, we certainly had lost Mischief Reef in 1995, Scarborough Shoal in 2011, Ayungin Reef in 2013, and perhaps the entire WPS in the future from China’s rising military power. With the arbitration process on the side, Chinese authorities reject it and commence in calling the Philippines a bully. How come a small country like ours, asking for military support from political allies, is being questioned suspiciously and done a reverse psychology by his big brother? Firstly, [The conflict with China] greatly impacts on us because the Philippines’ strategy has been to use international legal instruments because that’s the most we can do. We cannot contain the maritime strength of China because we lack the capability. A diplomatic protest is the most we can do (read related article published last November 30, 2012 at http://newsinfo.inquirer.net/315873/gazmin-calls-for-formal-protest-of-chinese-naval-patrol-of-disputed-territories). Secondly, the Philippines has long been confronted in the West Philippine Sea but has had limited capabilities to address this security issue. Moreover, the country has been focusing on an internal armed conflict for decades that external defense, such as the tug-of-war over territories in these waters, has been a secondary preoccupation for the government (read related article published on December 2, 2012 at http://globalnation.inquirer.net/58487/row-with-china-a-reawakening-for-ph-defense). Our problem with national sovereignty and territorial integrity boils down to various causes and effects. Apparently, there are conflicting international laws and historical claims among claimants. The Philippines suffers lack of maritime patrol due to lack of manpower, patrol assets, technology, surveillance system, and the mother of all issues – budget. There are also overlapping EEZ provided by UNCLOS. Definitely, there are many countries that have interests in the SCS as one of the major sea lines of communications (SLOCS) in the world. It will also result to incursion by claimant countries given the absence of an agreed code of conduct. As an effect, there will be confusing occupations and use of force which is very apparent now that will definitely challenge sovereignty and reduce territories of a country. Consequently, loss of economic activity to local fisher folks or to the national economy of a country as a whole may result. Furthermore, as tension escalates, it may further call for increased patriotism from each claimant-country. As political bickering rises, perhaps what we all fear to happen in the future may happen unless stakeholders clearly manage and responsibly resolve the territorial problem. Geographically speaking, WPS does not cover entirely the SCS. Don’t invade the West Philippine Sea!